It was the home opener for the Wichita Force, coming off a season opening loss to the defending champion Duke City Gladiators. The Force looked greatly improved in every facet of the game, but were no match for Robert Kent, Jr. and the Texas Revolution, who pulled out a 47-37 victory. There was no doubt entering the 2019 Champions Indoor Football League that the defending champion Duke City Gladiators had a really good defense. They were ranked first heading into the season, and that was clearly on display on Saturday as the Gladiators squad held the Wichita Force to just three points through the first three quarters on their way to a 76-24 victory. Force quarterback Joe Hubener struggled early on, but finished with 191 yards passing and 2 touchdowns. 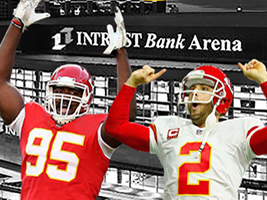 WICHITA, KS —There will be appearances by Kansas City Chiefs players at the Wichita Force’s home opener. Thus far, Chris Jones and Dustin Colquitt have both been confirmed to be in attendance at the game on Saturday, March 30 against the Texas Revolution. Kickoff is at 7:05 p.m.
WICHITA, KS – The Wichita Force, Wichita’s professional indoor football team, will hold a competition throughout the 2019 arena football season; giving Kansas pep bands a chance to win up to $4,000 for their districts endowment or foundation. WICHITA, KS – The Wichita Force, Wichita’s professional indoor football team, will hold open tryouts for the 2019 season on Saturday, December 1, 2018 at Hoover Field. Interested athletes should register in advance by completing the form at wichitaforce.com or calling the office at (316) 425-1965. Registration fees are $40 in advance or $55 the day of tryouts. WICHITA, KS – The Wichita Force, Wichita’s professional indoor football team, will play 6 games at home in INTRUST Bank Arena and 6 games on the road during the upcoming 2019 regular season. The Wichita Force kicked off the weekend with the earlier start on Saturday versus the Salina Liberty. The Force are continuing their strike to make the playoffs for the 2018 season. The I-135 rivalry game is always a classic when these two teams meet up during season play. Coming off of a close win over the Bismarck Bucks, the Force was looking to continue to extend their current winning streak. The Wichita Force returned to INTRUST Bank Arena and entered the game fighting for a playoff spot. The Force are looking to gain one of the top three spots for the Southern Conference. With the playoff race heating up, the team is looking to finish the season red hot! The Wichita Force played a hard-fought game that came down to the final seconds of regulation. The Force were able to pull out the win with a final score of 59-58 over the Bismarck Bucks. The Wichita Force returned to INTRUST Bank Arena on Cinco de Mayo to take on the Duke City Gladiators. Following the tough loss in Amarillo, the Force was excited to get back in front of the home crowd and execute the usual hard hitting and high scoring action on the home turf.